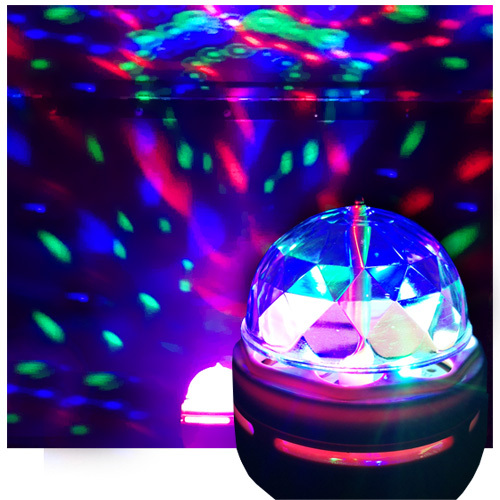 The LED Disco Party Bulb fits in a standard light socket and projects a dazzling light show on to walls and ceilings or in an overhead ceiling fixture to illuminate walls and floors.The Disco Party Light Bulb can replace any standard bulb and create an instant party with an explosion of colors! Crystal Rotating RGB LED Party Disco Stage Light Bulb. I was shocked and amazed at how well this performed! Works like Charm on ceiling fan lights. They screw into standard sockets, the kind on most ceiling fans and lamps. My kids are having a heck of a lot of bedroom dance parties. They are pretty neat! Purchased as a Christmas gift for my son- absolutely loved it myself! This was pretty cool! Works perfect. Brighter than expected. Lights up the entire 2 car garage. Couldn't be happier with this purchase. Best 7 dollar party light available. It was totally worth it! Easy to install (its just a bulb after all). and I must say it REALLY livens up the place.